For many months now we have been making the best of a dismally low cloudbase. It's been so long now that it feels permanent. It's like we're in a whole different place. Cloud Country! It's definitely a trickier kind of cross country flight when we are dodging clouds the whole time instead of just trying to max out our height at every chance. But we have to admit: the silver lining of these fluffy beasts is that they're just plain gorgeous. 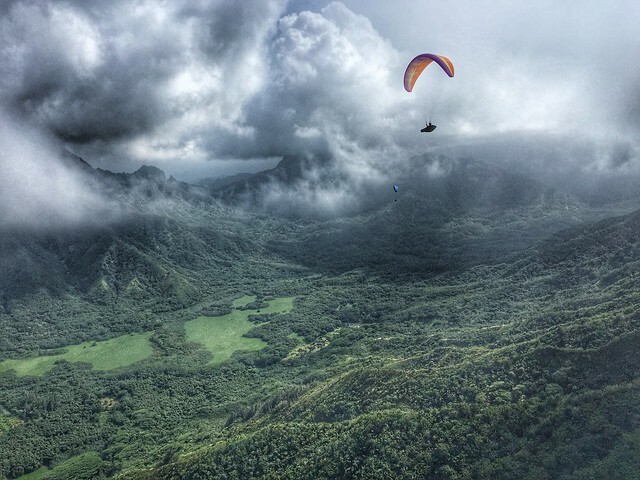 Fifteen pilots flew the last three days at Kahana and the clouds did not slow us down a bit, with cross country flights in all directions. I trust the day will come when we'll see the tops of our mountain ranges again, but in the meantime, I am loving the misty challenge of these cloud country flights. Thanks for the positive outlook and the great cover shot. Damn those Iphone6's, I still say its the photographer. I am going to slip my samsung5 into your flight deck and see what happens. Great pics and great editing!! I am working on a video of our day at Kua Loa. I'll post it when I get it finished. Like Jorge says, "if there are clouds, I know there is lift."